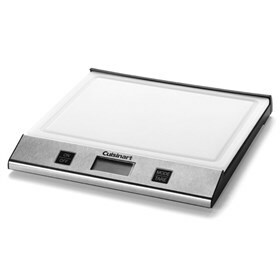 The Cuisinart KML-9 digital kitchen scale delivers accurate measurements for all your favorite recipes and has a smart design for convenient storage and display. It features a removable cutting board weighing platform that has gradient marks for easy measuring and inverts as a protective cover for a sleek countertop display. The KML-9 features add 'n' weight that allows to weigh multiple ingredients without starting from scratch and large LCD readout offers accurate readings in imperial or metric mode. The Dualpro Digital Kitchen Scale has many exciting features for users of all types. You can extend the lifetime of your Dualpro Digital Kitchen Scale with the purchase of a FactoryOutletStore Factory Protection Plan. The Dualpro Digital Kitchen Scale is sold as a Brand New Unopened Item.